It’s been a crazy few weeks over here my circus world! Galas, assessments, and engagements (WHAT??? ), so I apologize for taking so long to write. But here we go! First off, happy Thanksgiving to all! I just got back from a very relaxing break with my family (relaxing because I didn't tackle the mountain of things I had to do and instead went hiking and did a puzzle with my family). The first trimester at Circadium is over, and tomorrow starts trimester two! It's kind of crazy to think we're a third of the way through the year. New students are already beginning their application process, and though it feels like we just started, it's been almost 3 months already. Three weeks ago, Circadium held a fundraising gala commemorating the first class. I had wanted to write about it in my last post, but I figured you would all appreciate some pictures, so I held off till now. It was such an inspiring night, because it was an embodiment of our director Shana’s vision for what she wants the school to be. The night began with a VIP cocktail hour in the mansion (which was where the priests used to live when the building was a church). Then the main event started with a performance-based tour of the facility. The church was converted into a “dream laboratory,” where circus performers collaborated with artists in other disciplines, such as music and dance, to create this alternate world of contemporary circus performance. The tour let out into the main sanctuary, which was transformed into an incredibly elegant buffet-style dining area with a tightwire stretched high above, across the entire room. 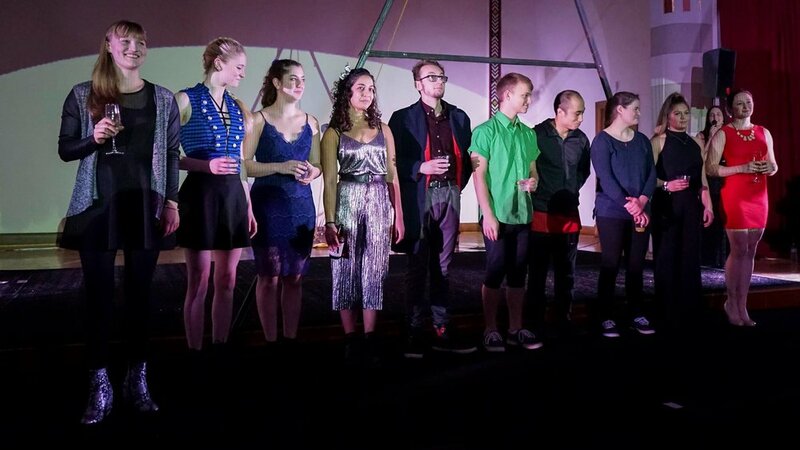 After a toast congratulating the first class, the gala culminated in a final performance, including a wire-walking act, a large group acrobatics piece, an aerial fabric act, finishing with Circadium class joining in at the end, scattered around the room performing various circus disciplines. I ended the night up in the air, performing ambient aerials on fabric. The night was so incredibly exciting because we got to see the excitement that we have for this school, demonstrated at a larger scale. So many people have been working for years to get Circadium off the ground, and getting to meet board members, financial advisors and arts programmers who have been collaborating on this since 2015 was rather inspiring. So much effort behind the scenes has been gone into making Circadium a success, and I’m so grateful to be a part of this ground-breaking first class. Circadium Class 1: Viola, Luna, Maya, Tara, Stephen, Zak, Cao, Delaney, Celeste, and me! This gala was kind of a turning point for us as a class. We were 2 months into the program, and our routine had become almost normal. We’d gotten through our first assessment at the beginning of October, then our second assessments on the Monday after the gala. For me, that second assessment was the one I was really curious to see the results for. I knew I was going to improve on my October assessment, because I went from sitting for most of my day and working out 1-2 hours in the evening, to working out most of my day and sitting to work for a few hours in the evening. But for the November one I wasn’t as sure. I'll share more about the details of my assessments in another post, because otherwise this one will go on forever. But I was really pleased to see continue improvement in everything. The biggest improvement from the past few weeks is not those numbers improving, but the confidence I’ve gained. As I mentioned in an older post, we spent the first month really cracking down hard on the basic core exercises, repeating and refining them again and again. And we are now starting to branch out into other exercises and tricks. We’re still working on things that are considered core exercises, but with such a strength and body awareness that I value more than I could ever have realized. This translates into my being able to confidently go into a trick I’ve never done and achieve success much more easily than I ever have before. In acrobatics, I’ve gained the body awareness to be able to really visualize moves and learn much more every time I do them. In juggling, I’ve become confidence in juggling 3 balls, rings, and clubs, and have moved onto 4 ball and ring tricks, passing clubs, and am attempting 5 balls. In aerial, I’m dissecting moves to understand fabric theory and how to give a single move my own unique twist. I feel this confidence that I’ve never had in my abilities to learn more, and I’m so excited by it. But the craziest of all things the past few weeks was that I got engaged! It wasn't just any old engagement though, because if you've ever met Emma, she goes all out. She had told me she was taking me on a little date, since with the business of her PhD and my school and work, we hadn't really had a date since I moved. To make this "date" special, she even blindfolded me before we got to the place. I should have suspected something by then, but what can I say, I'm trusting. After walking into the building, Emma removed the blindfold, and I was at Circus Culture, the place where I began this passion that has turned into my career. Not only was I at Circus Culture, but an audience of about 35 people was there, all with their phones pointed at me. I began to see faces in the crowd, people who definitely shouldn't be in Ithaca... my parents, siblings, Emma's parents and siblings, my best friend from college, my best friend from Ithaca, and many more. As our song began playing, three of my close circus friends who live in Ithaca began a beautiful aerial piece, which I found out after was inspired by our relationship. After the act, she pulled me up on stage, and read a beautiful letter she’d written me, and in front of all our friends and family, got down on one knee in front of everyone and asked me to marry her. So as you can see, November has been quite a whirlwind. I feel incredibly confident as I go into the second trimester, slowly starting to broaden my focus from training just strength and technique to more artistic exploration in the disciplines. Now is where it starts to get challenging, and where I begin to be tested as an artist. So here's to the next trimester!